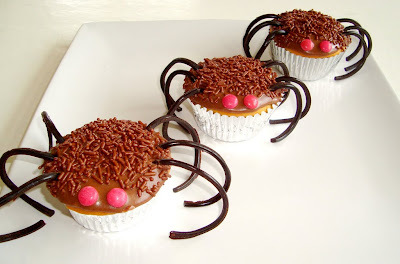 Today I baked one of my favorite Halloween treats: Spider Cupcakes. Yes these are so cute, they can even put a smile on my face when I have a sore throat like today. They are quit easy to make. All you have to have is black liquorice, chocolate sprinkles and red mini m&m's. You can use any cupcake-flavor you want but it looks especially nice when you make red velvet cupcakes (didn't have any red food coloring left, so I made vanilla cupcakes). I love my little araignées (French for spiders). - In a medium-sized bowl, sift together the confectioners's sugar and cocoa. 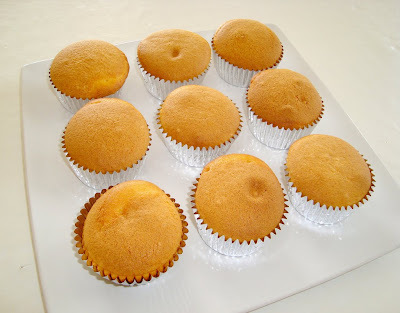 - Add butter, vanilla and milk and mix with an electric mixer to combine. Use more milk if needed. 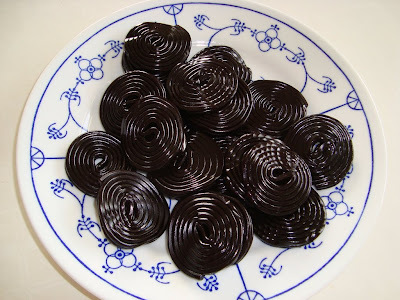 Black liquorice. 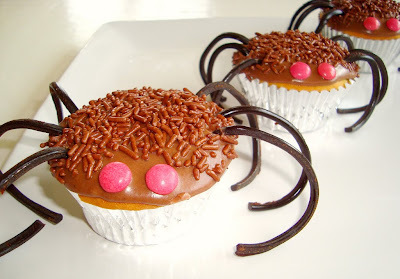 You unmold these completely and use them for the spiders legs/arms/what are they? Icing them is very easy and fast. You just put half a tablespoon on top of a cupcake and use the back of a teaspoon to frost the cupcake evenly, using a swirling motion. 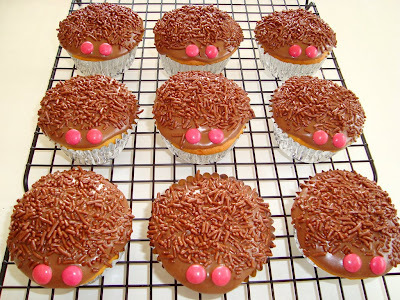 Then add the red eyes, and finally dip the cupcake into chocolate sprinkles. I used a cake tester to make three incisions on each side and then stuffed it with the liquorice strings. "Eat us or we eat you!" Ah-dor-able! So simple but festive. Love it. wow! great idea! Loved it! Will try to make it for my kids.. FUN!! Thank you for sharing!! Hehe these are so creepy and cool! Okay these are really freaking cute. Who knew spiders could be so adorable? Thank you anonymous! Happy New Year to you!